Whewww... 17 weeks came with the quickness and my handy Ovia app conveniently reminded me of the French pastry our baby is the size of currently: a creme brûlée, which of course I've been craving ever since Sunday morning. It seems to be a common theme for most of my friends, where the first trimester moves at a snails pace when only a select few people know your secret and you're feeling pretty rough. Then, before you know it you're (hopefully) feeling better and you're flying at high speed towards your 20-week halfway point. So that's where we're at. I thought it would be fun to do a little update on my pregnancy at this point and share how I'm feeling, cravings, & things I've bought for little one & I. Overall, I'm feeling pretty great. I had rough nausea starting at 8 weeks and finally at 11 weeks started on nausea medication (Diclegis) to help alleviate the symptoms. So that's been a lifesaver. The fatigue has let up a little bit and I've been able to get most of my energy back. During the week, I still hit that 3 o'clock sleepy stage, and will usually try to sneak in a few zzz's while Faire is napping. The bump is looking and feeling bigger and bigger by the day, but I'm totally embracing it! Also, this tiny sweet pea has been kicking up a storm. Funny how I didn't start feeling the kicks until we were 30,000 ft in the air on our way to Nashville. Feeling all the flutters and kicks for the first time this pregnancy brings back so many emotions of when Faire was in my belly. After flying back from Nashville, surprisingly the slight time zone difference has screwed me all up. I've been a night owl lately not heading to bed until almost midnight, and I'm up every morning at 7am. As far as sleep, the nausea medication has a sleeping agent, so thankfully that helps to keep me asleep for most of the night. My bump nest pillow is still packed away under our bed - and my husband isn't complaining about it, for now. All the p's. Pizza, pasta, and pickles. And some c's. Cereal, la CROIX, and cherries. I've been living in all things by the Storq maternity label, a beautiful, minimal line for the pregnant and postpartum mama. 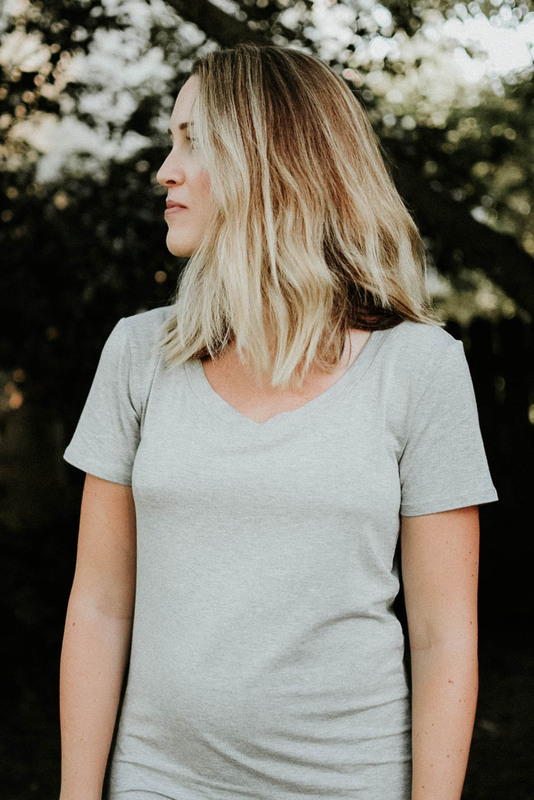 Luxuriously soft pieces that were designed to outfit the expecting mom for all months of pregnancy and made to last through the nursing and early parenthood stages. I was sent a few products to try out and every single piece is a dream. The quality, fit, style, all of it is perfection. I basically have a little capsule wardrobe built from four pieces and look forward to incorporating them with my favorite Fall essentials in just a few months. I'm already eyeing you up denim jackets & sneakers! The dress I'm wearing is the basic dress, which offers so many different styling options. I sized up a little to ensure it wouldn't be toooo snug by the third trimester, but even then the snug should hug the bump perfectly. It's the right amount of not-too-loose-not-too-tight, allowing me enough room to comfortably chase around a toddler all day. I'm thrilled to offer my readers 15% off your next order at Storq.com with the code 'fromamanda'! Other than dresses (because I'm limited on options in this 80-something degree heat), I've been wearing a few pairs of drawstring elastic waistband shorts, and of course, my go-to leggings. Given the season, all of my pre-pregnancy denim has been stored away in the closet until 2018. Not even trying to attempt squeezing into those. No hair tie, no thank you. For baby: I've only purchased ONE thing so far for the new baby. Literally, one single thing... who am I? This is it, an adorable bunny bonnet we scooped up while in Nashville. For me: These sneakers (still on sale at Nordstrom til 8/6!) because my old ones no longer fit - anyone else's feet get bigger during pregnancy?! Also, another tin of this organic shea butter for the belly. I just ran out of the first tin I bought while I was pregnant with Faire. I swear by this stuff and it's heavenly during the dry, winter months. Anxiously awaiting our 20 week ultrasound in three weeks. Hard to believe I will be at my halfway point so soon. Still need to purchase Madewell maternity denim - these and these have been on my list - they always seem to sell out fast, so hoping I can snag a pair or two before the weather cools. Oh, and we ended our little vacation in Nashville with a sweet, spontaneous gender ultrasound. I'll be sharing soon if this little babe is a boy or girl! This post was shared in partnership with Storq. All content and opinions are my own.